Stainless, slate, and one bright color mix to artful effect in this expansion project. 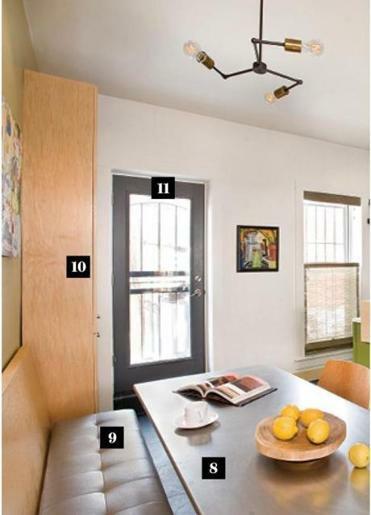 One home upgrade topped the wish list for a couple with a young child: a larger, more family-friendly kitchen for their turn-of-the-last-century row house in Roxbury’s Highland Park. The husband and wife love to cook and entertain, and the kitchen remodel was the most important aspect of a first-floor redo. “What a fun and adventurous couple to work with,” says Newton-based interior designer Diane Burcz. “Each had clear specifications for the kitchen: She wanted marble and an industrial look.” The husband, a professional artist, wanted color. By gutting the old kitchen and pushing it into the living space, they gained room for the informal eating area and for storage. And now that the sink is angled to face the open living/dining area, whoever is working there can easily talk to guests or family nearby. 1. Durable Brazilian black slate flooring helps establish the industrial look and is practical, too, for the room that opens onto a back deck. 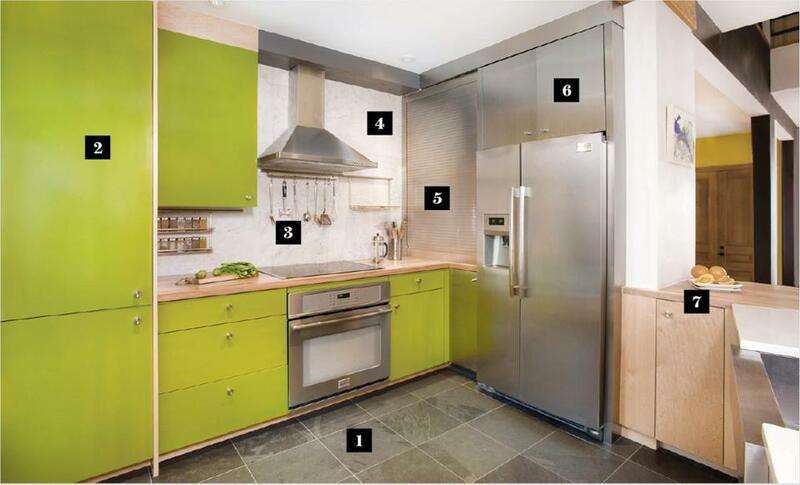 2.Cabinets were sprayed with Benjamin Moore Oregano in an easy-to-clean high-gloss finish. Their bright green matches the color in the living room rug, helping to unify the two spaces in the open floor plan. 3. The Hafele rail set mounted on the backsplash keeps cooktop tools handy while limited counter space stays clear. 4. Burcz delivered on the wife’s wish for a marble backsplash using more affordable 18-by-18-inch white marble tiles rather than a pricier marble slab. 5. In the corner next to the refrigerator, an appliance garage, also from Hafele, conceals kitchen tools and has a door that rolls up so that it doesn’t interfere with counter space. The countertop continues into the appliance garage, extending work space when the door is open. 6. The Wilsonart Alumasteel cabinets look like stainless steel but are actually laminate on plywood — easy to clean and, unlike real stainless cabinets, dent-resistant. 7. Burcz’s clients wanted wood countertops, and birch butcher block was the perfect choice — they’re great for cooking prep and tie visually to the unstained maple plywood cabinets, she says. 8. In the eating area, the stainless steel “Walker” dining table from Room & Board echoes the cabinets, appliances, and sink. 9. The banquette with Kravet “Delaney” vinyl cushion has sliding-door storage below. 10. A tall cabinet near the back door holds pantry items and is conveniently situated for storing outdoor-cooking tools. 11.Window and door frames are painted dark gray to mimic steel.